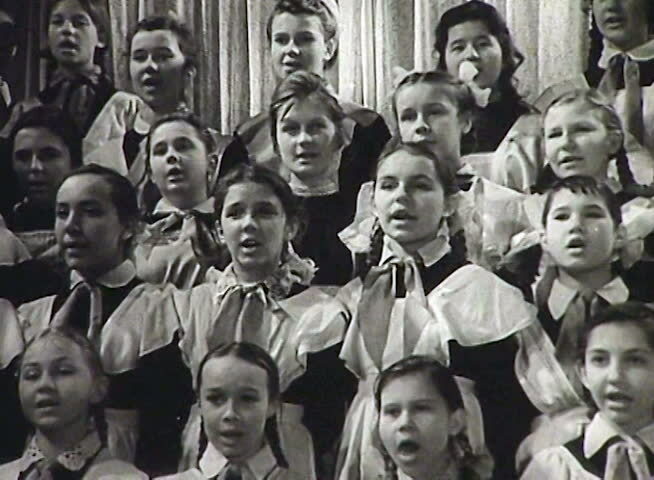 FORMER U.S.S.R. - CIRCA 1950-1960: Children's choir. Newsreel of the USSR. sd01:361950s: Virtuoso violinist Jascha Heifetz performs March, by composer Sergei Prokofiev, from the opera The Love For Three Oranges, in a theater, at a college, in 1953.
sd02:021940s: College fight song is sung by a chorus in this 1940s soundie featuring football. sd02:261940s - Footage of Arnstadt Mauthausen Austrian Nazi Concentration Camp victims.